Allocate time entries to projects, organize projects around clients (or departments), and add tags to keep your data organized. If you do client work, name projects with the title of the assignment given by your client (e.g. “E-commerce Analytics”, “Website Redesign”, “SuperApp”). You can also have a special project where you’ll put all non-billable time entries (eg. emails, time-off, meetings). If you do client work but want to keep it simple, you can just use client’s name as the project name and then use tasks to indicate what type of service you’ve provided. If you have common projects for different clients, you can use projects for the type of service (eg. marketing, development) and use tags to indicate for which client a particular time entry was. If you don’t work with clients, you can use projects as general areas of work (eg. sales, operations, support). If you use Clockify for tracking personal productivity, you can name projects by activity (e.g. emails, working, learning, cooking). Projects are the primary mean of organizing your time. 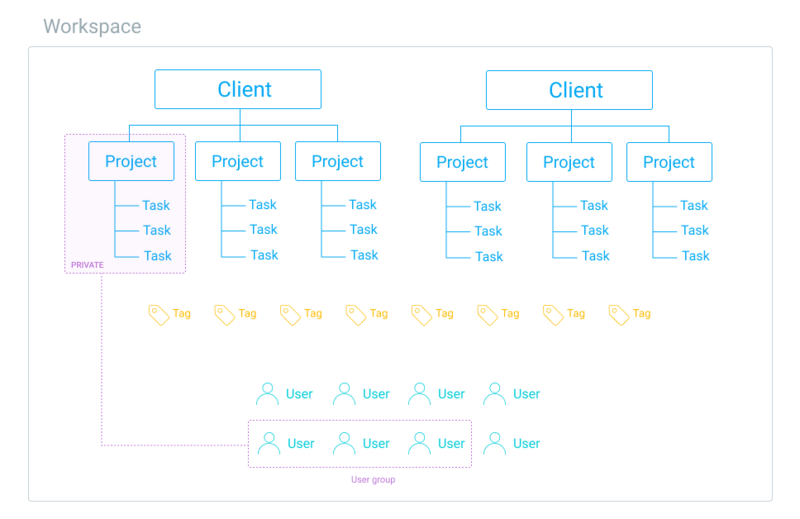 At a higher level, you can organize projects around clients (or departments or whatever else). Clients are used to organize projects. If you don’t organize projects by clients, you can change the “Client” label to “Departments” or anything else you want (edit “Client” label by hovering over the “Client” tab in your workspace settings). A client can have many projects, but a project can belong to only one client. It’s not possible to add just a client to a time entry as clients are used as a grouping mechanism for projects. But, you can create a project named after a client. Alternatively, you can create a tag for each client and add it to a time entry, so you can later group entries by tag. If you need more control, you can further classify time entries using tasks (ie. sub-projects or jobs) and use them to designate the type of work (e.g. design, writing, programming), or whatever else you want (eg. bugs, sprint A, phase X). While tasks are commonly used to designate the type of activity (eg. Design, Coding), description field is most commonly used for the actual thing you’ve worked on (eg. “Fix bug #638”). When projects and tasks aren’t enough to keep things organized, use tags. The best thing about tags is that they are available across the workspace. Tags work regardless of the project so you can create one tag, use it on multiple projects, and filter reports based on them. You can even use multiple tags to filter reports with more precision. Tags are useful because you can use them as keywords by which you can filter reports to find exactly what you need. Before you can use tags, you have to create them in Tags either in workspace settings or by typing the new tag name in the tag picker and pressing ctrl+enter. Once you’ve created a tag, all users in your workspace can select it when tracking time. Everyone can create tags (though you can limit creation to Admins only in workspace settings). Only admins can edit, and delete tags.